Feathers: It is perfect item to decorate your room, sofa, cars and chairs, ect. The most timeless and comfortable fabric in fashion. Durable and easy to look after. The real color may not be the exactly same as showing in the pictures due to the color difference of monitors. Size: 18(L) x 18(W) Inch (45cmx45cm) . Attention:When you put the insert into the pillowcase, must firmly compress insert put in slowly, and should be put the insert middle hard down to small so easily into the pillowcase as far as possible, if you plug in violence will be very easy to damage the zipper and material..
Beautiful covers that fit over existing pillows and are a wonderful addition to your decor. 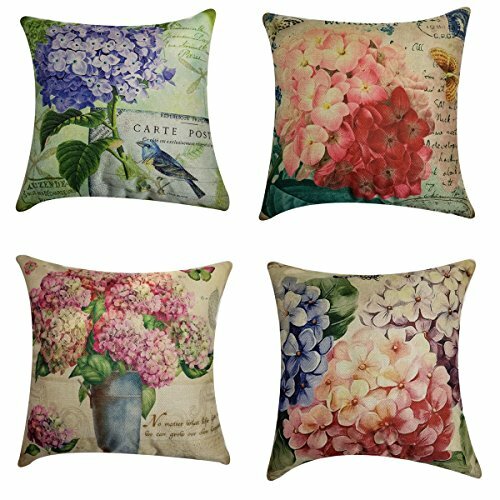 Set of 4 Pillow Cases: 18(L) x 18(W) Inch, 45cmx45cm. Material: cotton canvas fabric . If you have any questions about this product by NING, contact us by completing and submitting the form below. If you are looking for a specif part number, please include it with your message.